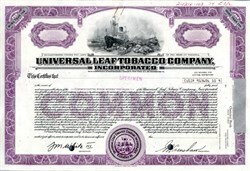 Beautifully engraved RARE specimen certificate from the Universal Leaf Tobacco Company. This historic document was printed by the American Banknote Company and has an ornate border around it with a vignette of a ship in port with dock workers. This item has the printed signatures of the Company's officers. Universal Leaf Tobacco Company has its origins in the late nineteenth century, with the J.P. Taylor Company and its founder, Jacquelin P. Taylor. In 1918 the J.P. Taylor Company merged with five other leaf tobacco dealers to form Universal Leaf Tobacco Company. The company is now known as Universal Corporation, a holding company with interests in commodities in addition to tobacco. Universal Corporation (NYSE: UVV), headquartered in Richmond, Virginia, was founded in 1918. The Company is the world's leading leaf tobacco merchant and processor, based on volumes handled by its subsidiaries and affiliates, and has operations in agri-products. Universal conducts business in more than 30 countries and employs more than 24,000 permanent and seasonal workers. Universal's business includes selecting, buying, shipping, processing, packing, storing, and financing of leaf tobacco in tobacco growing countries for sale to, or for the account of, manufacturers of tobacco products throughout the world. Universal does not manufacture cigarettes or other consumer products. The Company's revenues are derived from sales of processed tobacco and from fees and commissions for specific services.